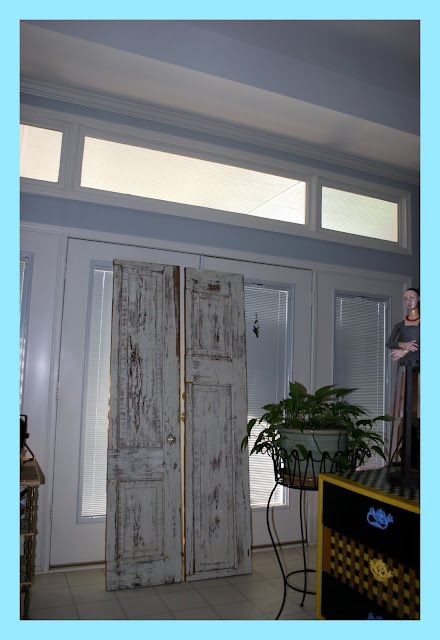 Dimples & Dragonflies Studio & Gallery LLC: "Farmhouse Door"
One Of The Best Things About Living In The South Is The Close Connection We Have To Farming (Past And Present). My Husband And I Particularly Enjoy Visiting The Older Rural Farmsteads, And On One Of Our Outings We Were Blessed To Find An Old Farmhouse That Was About To Be Torn Down. Thankfully The Owner Allowed Us To Retrieve Anything We Were Willing To Haul Off That Day..And Robert And I Went To Work Removing Anything We Thought Had A Chance At A New Life. A Once Solid Door Has Now Been Cut In Half (Courtesy Of My Husband) And Over The Weekend I Took An Electric Sander To The Surface And This Is Where I Stopped. Just Wanted To Share The Results Of Our Efforts And Give Y'all A Peek At What I'm About To Start Working On. Hey..And If Anyone Has Any Suggestions On What Direction They See These Pieces Going In..Please Let Me Know. I'm Needing A Lit'l Inspiration. Oh, boy, Terri, how awesome is that!! How fun to stumble across something like that and you are lucky that your hubby appreciates it too. I would not have that part in my favor... Can't wait to see what develops!! I think it is a blessing to have a husband to share your interests...can't wait to see what you come up with! Wow! What a find! Stuff from old villas here is SO expensive! Ooooo, love those old doors. I would so love to visit the south one day. So much beauty and history. I presume there will eventually be an amazing painting gracing those old doors. Maybe a diptych? I LOVE old doors!! 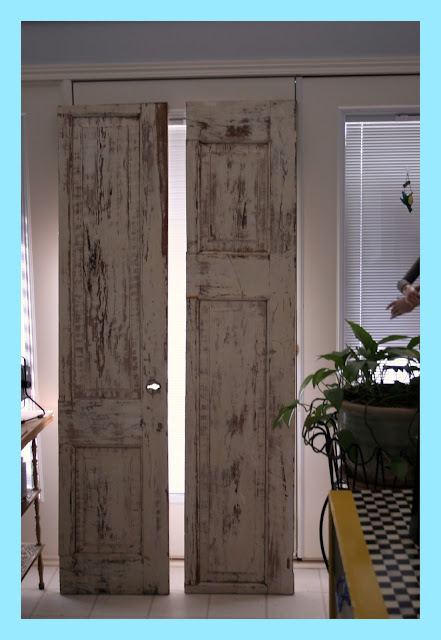 I have "refinished" (as in remove the 20 coats of paint and leave the scared wood bear) some old doors in the past, and just put them like decoration, just like art themselves. How about some kind of room divider with some of your art hanging from it? Oh--whatever you do, I know will be magic--these are a treasure! wow - what stunning doors and a great opportunity! There is nothing like that where I am! Except maybe little english pine stripped doors which I was fortunate enough to find some nearby my home a couple of years ago.